Providing an entire community college campus serving 11000 students, Gateway Community College is an excellent example of how thoughtful architecture can create a state-of-the-art educational environment while contributing to significant urban revitalization. 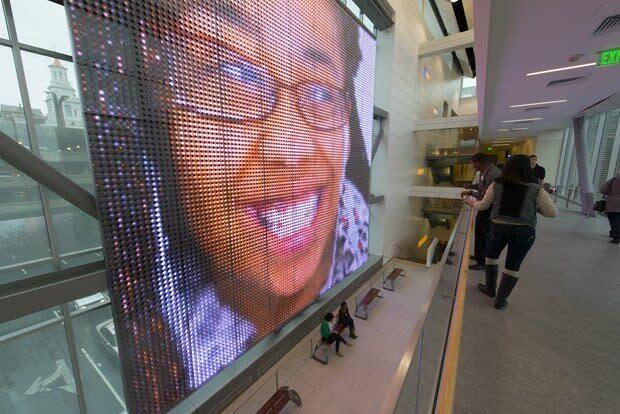 The faces of 350 students, teachers and administrators at Gateway Community College appear every 30 seconds as a slow-motion video sequence on a large 11 x 11 meter low-resolution LED video screen, viewable both inside the lobby and to the street. The centralized location of "College Faces" demonstrates GCC's commitment to the community and establishes it as its prominent member. 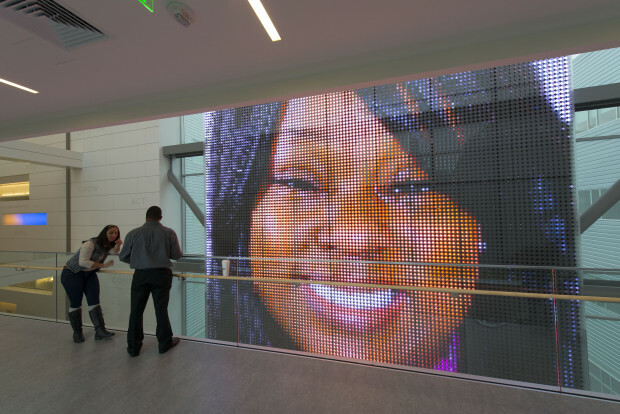 While the artistic approach and meaning were left to the selected artists, the primary goal for commissioned artwork was to be site-specific, and respond in some compelling way to the mission and culture of Gateway Community College With this in mind, a highly prominent site, forming one side of a multi-story glass bridge at the center of the campus, was defined during the architectural design process. 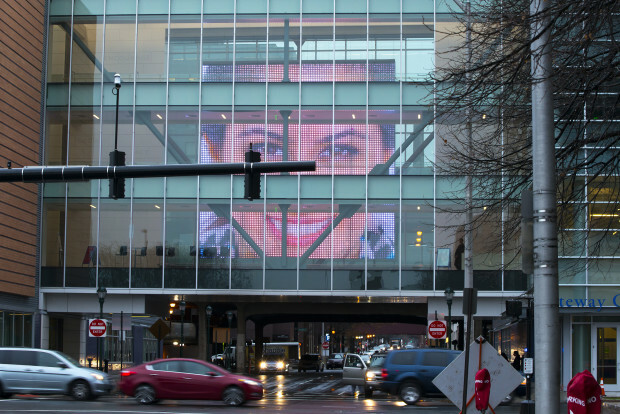 This location is visible not only from within the school, but from the city streets as well, so that an implied goal was for the artwork to help visually connect the interior of the college with the community around it. 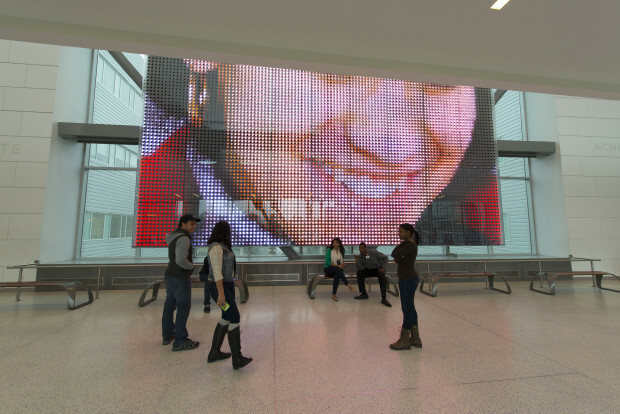 The process for selecting and commissioning art for Gateway Community College was managed by the Connecticut Commission on Culture & Tourism. 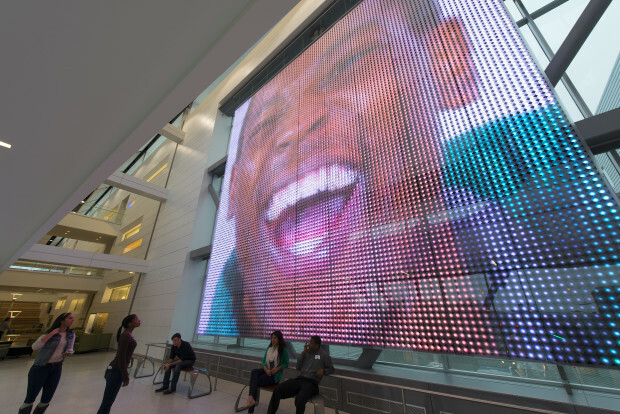 The State reserves 1% of the construction budget of each State-funded project for artwork to be integrated into building projects. Over the course of several months, a committee of 10 people including building users, architects, construction managers and representatives from the State evaluated numerous artists who submitted conceptual proposals in response to a public request from the client. This group was narrowed though a series of review meetings down to three artists, who were invited to an interview to present their concepts for the project. The committee then evaluated these artists individually and sent questions to each of two final competitors, in the end selecting Electroland as the winner. 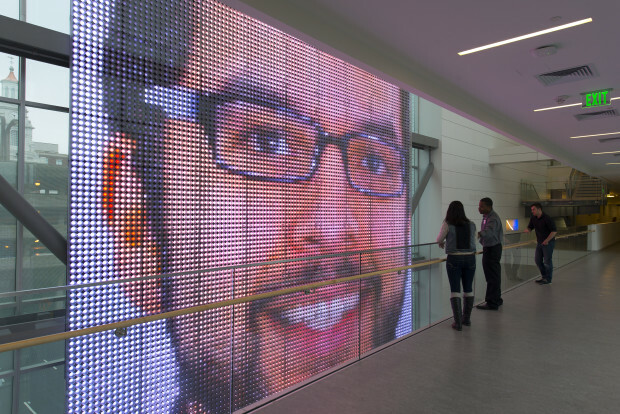 This artist’s collective, from Los Angeles, prepared a more detailed construction package and cost estimate, which was used to incorporate into the overall construction budget and schedule for the project. Electroland personally supervised the installation of the work and ensure it was operating properly.